Many men enjoy wearing flip flops in their home, at the beach and even around town. However, it isn’t always easy to find durable flip flops that are comfortable and fit well. In order to help people find the best pair of flip flops for men, we have searched high and low for those perfect pairs of flip flops. The Reef Fanning Sandals have several features that many men love. They come in a variety of sizes from size four through size fourteen and in several different colors. They are made of leather with a 1 inch heel in the USA. They also sport the Reef logo and have a concealed bottle opener in the heel making them the perfect beach sandal for those who enjoy a good cold beer. There are several advantages to these flip flops. Users find them to be extremely comfortable and durable. They run true to size and are easy to clean. In addition, they are great for outdoor wear and offer a nice heel support. Several men like the working bottle opener. 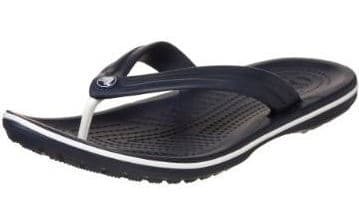 Crocs have been making comfortable flip flops for several years now and these Crocs Men’s Yukon flips are one of their best selling men’s flip flops. They have several nice features including the fact that they come in sizes 7 through to size 13 and are made of leather with an oiled leather thong. These flip flops have a nub foot bed that offers gentle massage to the bottom of your feet while you are wearing them. They come in Espresso or Khaki/Coffee. Users find several advantages to these Yukon Flips including the fact that they are made in the USA and can be used both indoors and outdoors. They are comfortable as well as extremely durable and men find walking in them extremely easy. There is a minor disadvantage to these flip flops that they run a bit large. The Reef Men’s Phantoms Thong Sandal is another popular flip flop by Reef that is loaded with some great features. They come in sizes 4 to 17 and in a wide variety of different colors. Made of synthetic and mesh with a man made sole, these sandals are water friendly. They consist of a Nubuck upper and EVA outside with anatomical arch support. They also have an air mesh lining and offer several advantages to users including the fact that they are lightweight and comfortable. Men state that they fit well allowing you to walk long distances in comfort. Most of them find them to be extremely durable and reasonably priced. Nevertheless, I did come across a handful of comments where people said that the straps on these sandals tend to become lose from the body of the sandal, after a certain amount of use. The Reef Men’s leather smoothy Sandal is a great looking flip flop sandal made from leather and has the following features. It comes in sizes 4 through 15 and in three masculine colors brown, black and bronze. It also has a leather non marking outer sole and triple density EVA construction. It is extremely stylish looking for those men who want to look stylish even on trips to beach or in their own backyard. The vast majority of people who purchase these sandals really like them and find that they offer many advantages. Not only are they lightweight and stylish but comfortable and durable as well. Best of all, they need very little time to break in. Users also like the fact that they are made in the USA. There are a couple of disadvantages to these sandals including the fact that they run slightly small and they are not designed for men with very wide feet. These Teva Men’s classic flip flops are reasonably priced and have many classic features. They come in several different sizes and there are different colors with several choices in the design of the straps. They have fabric straps and rubber soles with webbed upper and EVA foot bed. They also prominently display the company’s logo. There are several advantages that men notice when owning and wearing these flip flops. They are comfortable and good for wearing throughout the day. They are sized correctly and are both well fitting and lightweight. Users do mention that they require some breaking in and they are good for both indoor and outdoor wear. The main disadvantage I could find is that they are not designed for men who need wide sized shoes. 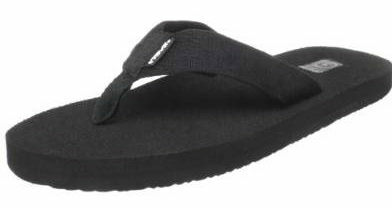 The Crocs Unisex MODI flip flops are a popular model of the Crocs flip flops. They have several features that may be of some interest. They come in sizes 4 through 13 and several different colors. The heel measures about 1 inch with the platform measuring ½ an inch. Like all Crocs, they have a nub foot bed that massages your feet as you walk and they have a slip resistant non-marking outer sole. They are lightweight and flexible as well as extremely comfortable on all different types of surfaces. They also provide some arch support for people who have tired feet. While reading numerous reviews, I was able to find one person who said that these flip flops tend to shrink when left out in the sun or heat for a long period of time. The Skechers USA Men’s Fray Cotton Thong is extremely popular especially among younger men who enjoy looking cool in shorts and flip flops. These thongs have several nice features worth noting. They come in three great colors Chocolate, Brown and Black and also in sizes 7 through 14. They have rubber soles and foamy cushioning. They come with a cool looking frayed edge strap, a grippy outsole and an embossed logo. Besides just looking trendy, these flip flops have some other nice advantages. They are extremely comfortable making them easy to wear all day even when walking on sidewalks. They are casual looking and don’t pick up odors. They are lightweight and many users find them to be pretty durable. The Crocs unisex Crocband flip sandals are designed to be worn by both men and women. They come in sizes 6 through 10 and have a synthetic sole. The heels measure 0.75 inches with a 0.5 platform. These sandals come in several different colors and many of the colors are suitable for men. Users find them to be great for the beach as well as for around the house. They are quite comfortable even when worn for long period of time. In addition, they provide a good traction on wet floors. You should bear in mind, though, that they might shrink if they are left in the sun too long. The Sanuk Men’s Beer Cozy Flip flop is a nice looking sandal that has several interesting features. These flip flops come in sizes 6 to 10 and in 9 different colors. They have a vegan leather strap with a soft jersey lining. The foot bed is made of yoga mat material and has an arch cookie for added comfort. There is a nylon webbed toe post. Men find these sandals to be incredibly lightweight and require little or no breaking in to be comfortable. In fact, many users state that the strap is the most comfortable strap of any flip flops they have owned and that the flip flops are quite durable. This Teva Men’s Mush II flip flops are stylish and comfortable. They come in a variety of sizes ranging from size 7 through size 16 and in 10 different colors. They have a synthetic sole with a dual density EVA midsole as well as grippy traction to make them non slippery on wet ground or on the sidewalk. There are many advantages including the fact that they are soft, comfortable and lightweight. They fit according to size and conform well to fit your feet perfectly. They also don’t tend to hold onto odors. One disadvantage I could find is that they dry slowly when wet. All in all, these best flip flops for men are all popular buys so one or even two pairs of these great looking flip flops will be perfect for your needs.